After making some Basil Pesto, I knew I had to find more ways to eat it! Since we had some sun dried tomatoes and feta cheese, I thought about combining everything into a swirl biscuit. Swirl biscuits are one of my favorites since they're fun and look fancy while being fairly simple to make. (Check out these other swirl biscuits.) Plus, you get flavor in each and every layer! 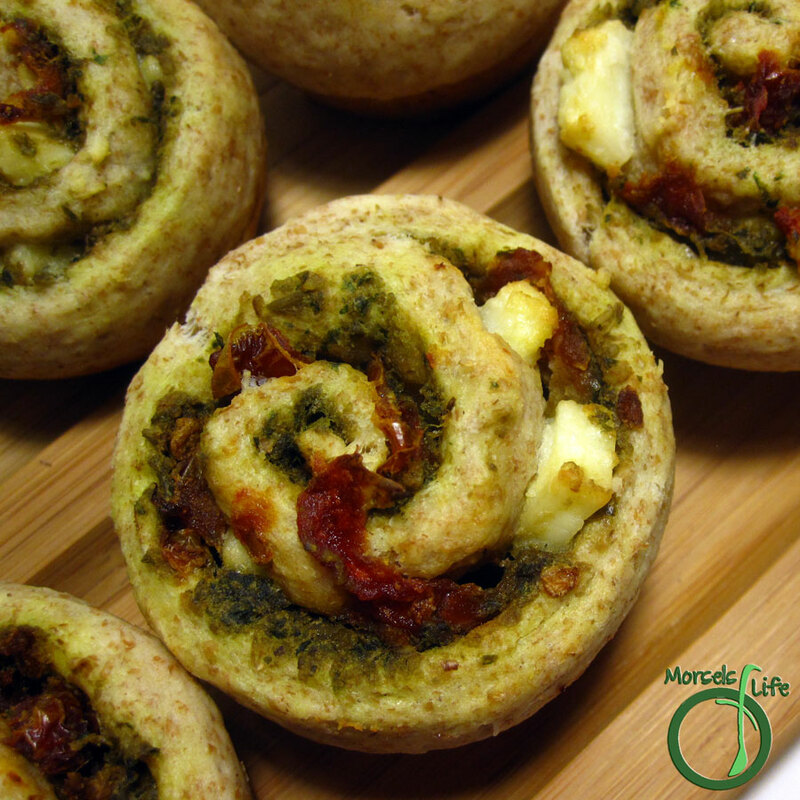 Pesto and sun dried tomato swirl biscuits with feta cheese perfectly combine these Mediterranean flavors! Give them a try and see for yourself. What's your favorite biscuit flavor? Form dough by combining water and DIY Bisquick. Roll out dough into an approximately quarter inch thick rectangle. Spread basil pesto on dough, and then top with sun dried tomatoes and feta cheese. Roll up dough into a log, and cut into 1 inch slices. Bake at 350F for 15 minutes, or until biscuits are golden brown. I love the "flavor in each and every layer" aspect. Swirl biscuits sound easy AND delicious. I love flavor in every bite! Thanks for Sharing at Show Me Your Plaid Monday's! What a great combination of flavors! I can see eating these with a big salad! Yum. I like your DIY bisquick recipe too! Thanks for sharing this great recipe at the In and Out of the Kitchen link party! I cant wait to see what you bring next week. Oh my goodness - these look amazing! haven't successfully made a swirl biscuit, but this has me determined to try. Found you @ In & Out of the Kitchen link up! those look so good ! Thanks for hosting and stopping by. :) They DIY Bisquick really makes things quick and easy! These biscuits are def worth the effort. :) Which part do you have difficulty on usually? Good luck! Believe it or not, we are hosting Bible study at our house on Sunday, and I need to make something green with an Italian theme. I think I just found it! Thanks for sharing at Pinworthy Projects. These look so good! We are invited to a potluck with some church friends on Sunday. I think I may just be making these to take with us! :-) Thanks so much for sharing with "Try a New Recipe Tuesday." I look forward to seeing what you will share this week. These look delicious! I love the flavor sun-dried tomatoes gives a dish. Already pinned, thanks for sharing! Me too! They add such a wonderful burst of flavor. :) Hope you enjoy! Sounds yummy.. and you just reminded me that I have a jar of pesto in my freezer to use up.